Card Details: Flourish is stamped in versamark on Chocolate Chip and Soft Sky card stock, edges are sponge daubered in Chocolate Chip ink, then layered on a White card stock base. Cherish is stamped in Chocolate Chip. 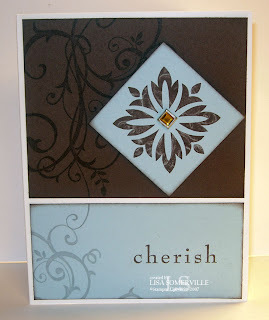 Image is stamped in Chocolate Chip, then kissed to the flourish stamp, then stamped on Soft Sky card stock, add a Fire Square Rhinestone Brad and adhere to card with dimensionals. The cool looking brad I used on this card is also a new product in Stampin' Up! 's Fall Winter Collection, the brad is from the new Rhinestone Brads Collection - Fire Squares. Etha Asked "when you stamp with versamark, does it take a long time to dry on the cardstock? I really only use that stamppad for embossing but I like the effect that you get with it on this card. " My response: Versamark can also be used as a watermark on your card stock - thus taking on what ever color card stock you are stamping on. It doesn't take long at all to try. 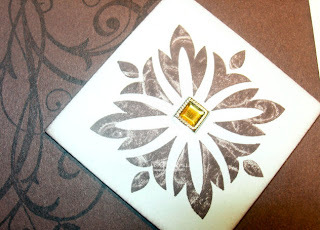 Another cool thing to do with versamark is to ink your image in versamark, then in a dye ink, stamp and clear emboss - now you have endless possibilities for colored embossing powder! I finally was able to subscribe to your blog. Your work is beautiful. I love the simplicity and elegance of these cards. Seeing your work really inspires me!! That is beautiful! At the moment I love chocolate brown in any combination, funny how we go through different color preferences! My question is, when you stamp with versamark, does it take a long time to dry on the cardstock? I really only use that stamppad for embossing but I like the effect that you get with it on this card. This is gorgeous! I love the kissing technique with these stamps. Now I'm going to have to try it.